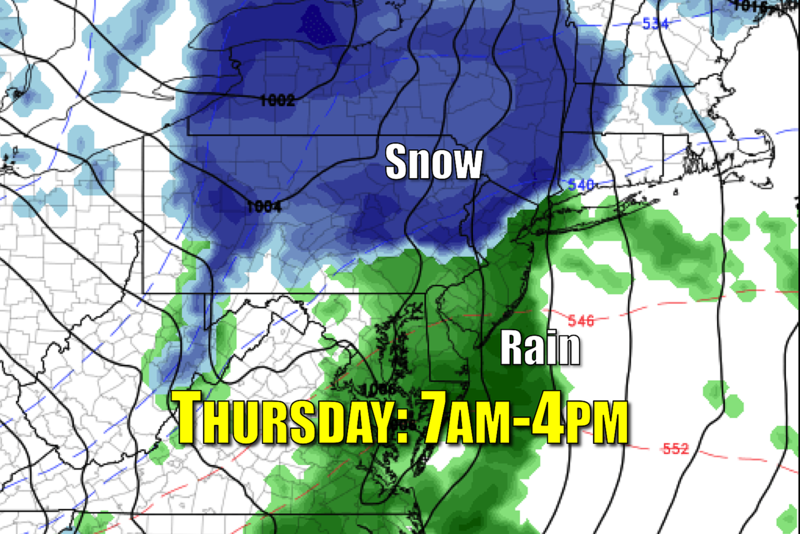 While Thursday's wintry weather will be limited to North Jersey, an inch or two of accumulation could make Thursday evening's commute messy. Just 24 hours ago, I fully expected to come to work this morning and create a snow forecast map for Thursday's storm system. But our latest forecast backs away from the wintry solution, thanks to slightly warmer temperatures and a slightly tweaked storm track. There's a good reason that we let snow forecasts play out slowly and carefully - there are just so many factors to consider in determining timing, precipitation type and intensity, and potential accumulations that we rarely have a confident view of the forecast until 24 to 48 hours in advance. That's why I say it's important to continually monitor the forecast, which is an "evolution" of our latest thinking given the latest data and analysis. Anyway, back to the present... Wednesday will be a mostly quiet weather day, although we're back to the cool side of the world. On Tuesday, high temperatures statewide reached the lower 60s - over 20 degrees above normal and just shy of record highs. Wednesday afternoon's max temps will be limited to the upper 30s to lower 40s. Skies will range from partly sunny in North Jersey to mostly sunny in South Jersey. And, as a brisk wind occasionally gusts over 20 mph, the wind chill ("feels like" temperature) will probably get stuck in the 30s all day. Clouds will begin to increase Wednesday night, ahead of our next storm system. Overnight lows should end up in the chilly upper 20s to lower 30s. CHANGES? There are two important tweaks to the forecast: 1.) The pool of coldest air stays further north, and 2.) The core of heaviest precipitation stays further south. This combination of forecast tweaks serves to limit (but not eliminate) the wintry weather impacts in New Jersey. WHEN? Models have resolved very nicely regarding the timing of Thursday's precipitation - about 7 a.m. to 4 p.m. (with residual showers possible through Thursday evening). HOW MUCH? An inch or two. Maybe three. Again, limited to far North Jersey. I think it's telling that even the overly cautious National Weather Service has not issued a Winter Weather Advisory for NJ (as of this writing). IMPACTS? The timing of this storm system is fortuitous, as the heaviest precipitation starts after the morning rush hour and before the evening commute begins. Still, wet and/or icy roads could be an issue for a while on Thursday. But again, it looks much more like a "wet" day than a "wintry" day. Skies will begin to clear Thursday night, but a brisk westerly wind picks up. So Friday will be blustery, with high temperatures barely in the lower 40s accompanied by wind gusts above 30 mph. A few snow showers may pop up Friday afternoon - just the "conversational, pretty" type of snow. Before you know it, the New Year's weekend will be here. And the forecast looks pretty good. Saturday is New Year's Eve, and our forecast shows a pleasant mix of sun and clouds with seasonably cool temperatures on either side of 40 degrees. As the ball drops at midnight to usher in 2017, temperatures will be in the 30s. I'm seeing a weak cold front passing through New Jersey late Saturday, which could kick up the winds for your NYE celebration. Wind chills will probably be in the 20s (at best) - be sure to bundle up if you'll be ringing in the new year outdoors! Despite that brisk northwest wind, temperatures for New Year's Day on Sunday look to warm to near 50 degrees under mostly sunny skies. Next storm system will be around Monday-Tuesday. Still looks like just rain, but subject to change.